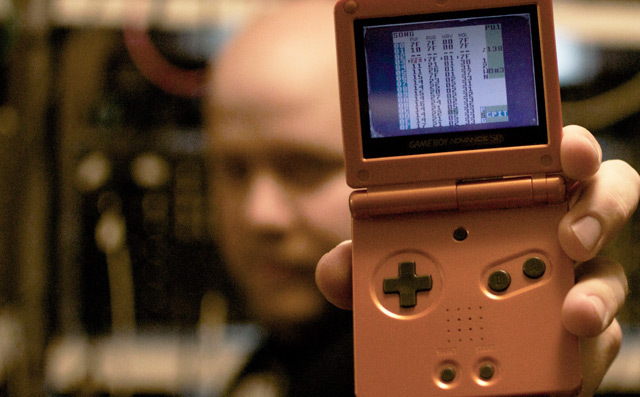 In the mid-2000s, the chipmusic scene experienced something of a boon. No, it didn’t technically break into the mainstream, but its worldwide community finally found a place to meet up, share music and encouragement, and just thrive. As I mentioned in the first part of this interview series, this wasn’t any physical venue, but an online one. 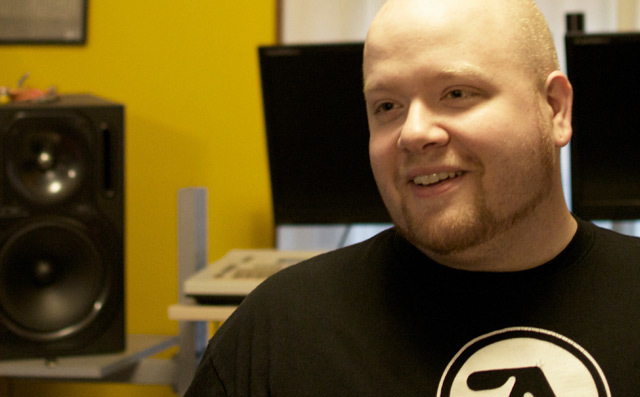 In 2006, Logan Erickson (Low-Gain) and Stefen Keen (Unicorn Dream Attack) discovered 8-bit Collective, or 8bc.org. We both joined 8-bit Collective probably around late 2006. It was shortly after it had started up. I think it had to have had somewhere between like 250 to 500 members at the time. 8-bit Collective was cool because [8bc founder Jose Torres]’s concept was [to] just have a place where people can upload songs and have a forum. At that time, we really got passionate about it. We really wanted to push to get the community as big as we could. Jose, because of how active and involved we were, made us admins on the website. We didn’t necessarily ask for it. From when I was an admin, [from] when I started to when I left — or when I was removed — we went from somewhere like 250 to 500 people to 25,000 people. I mean, that’s huge. How many of those accounts were actually real? We don’t know. I mean, if you didn’t like your screen name you could just make another account. [But] even if you were to say 30% of [those were] fake accounts, it’s still thousands of people. It was amazing to think that there were that many other people around the world that were into this. We worked really hard for that website. I got so passionate about it, I kind of became Jose’s number two. Because he wasn’t really around. Stefen and I started a podcast, called it Microsound DJ, and we did ten episodes. I think we [wanted to] do this like every other week or something. And that’s all over the course of a few months. It was great. We had some guest DJs, and we basically would sift through all the songs [uploaded to 8bc.org] and pick an hour’s worth of material to play that we really enjoyed and thought people should download. And it became the official podcast of 8-bit Collective. This huge focus on a web-based chip scene doesn’t mean there weren’t physical chipmusic events going on around the world. In 2006, the first Blip Festival took place in New York, an annual event where several of the world’s most prominent chip musicians would come and perform. Being a part of 8-bit Collective’s staff gave Logan an opportunity to attend 2007’s Blip Festival. We flew out to New York for Blip Festival 2007, and we did a livestream for 8-bit Collective. We were trying to stream the whole show. That was when we met Jose for the first time. He’s in Rochester. At least, his parents are. I don’t remember where he was going to college at the time. It might have been in Rochester. So, that was when we met him in person. And he was super awesome. [As for Blip Festival,] we had this computer so people could see the website and sign up there at the show. [We were] trying to raise awareness for 8-bit Collective, because it was like, ‘Hey, if you like what you’re seeing here, you should become a part of this community.’ I had buttons made. We did a compilation that we were handing out. 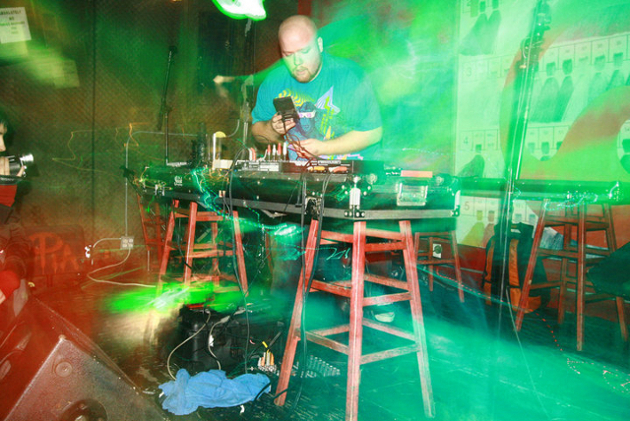 By the following year, Logan and Stefen had become so widely known that they were asked to play Blip Festival in 2008. Stefen and I ended up playing in 2008. Both of us. Somehow we got on. That kind of gives you an idea of how hard we were pushing. You get thrown in spotlight in a sense, because you’re trying to support the community and whatnot. But yeah, we ended up playing Blip Festival, and that was, to me, the height of it. There’s nothing bigger than that in the chip music scene. And it was fantastic. Of course, by this time, Logan had dropped the moniker Lameboy in favor of Low-Gain. 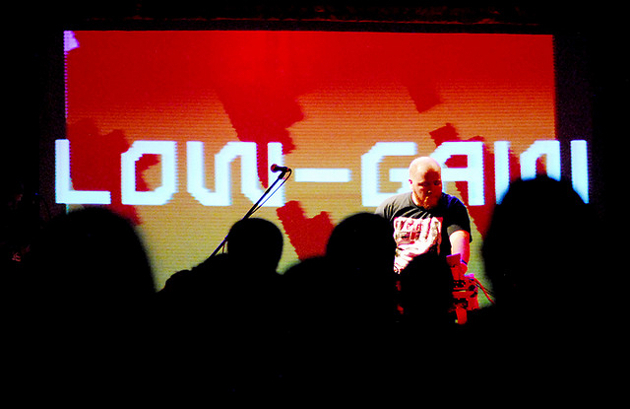 Low-Gain performing at Blip Festival 2008. Photo by Chiptography. [In] 2007, I dropped Lameboy, because I was giving it a lot of thought and it was really degrading. It seemed kind of childish and silly. [And there was also] the fact that there was the [Lameboy] emulator out at that point, even though, as far as I’m concerned, I was there first. So I dropped Lameboy and switched over to Low-Gain in 2007. And that’s where I’ve been since, as far as performing. All the while, 8-bit Collective was thriving. Unfortunately, massive growth spurts tend to be accompanied by growing pains, and 8bc certainly had some growing pains to work through. I was trying to keep all the admins and the moderators organized, saying, ‘Who’s going to watch this, this, and this?’ It was all volunteer. Nobody got paid. Nobody was making any money on it. We were all volunteering our time, and some of us could give more time than others, and that’s fine and whatnot. I tried to put together the subforums and how things were going to be laid out, and try to get the thing as organized as possible. We had a pretty large team of people. I mean, I think there [were] at least ten of us. Ten or fifteen of us, maybe more. And it just kept growing. Of course, on a forum, your post count just goes ridiculously high because you’re talking so damn much. But with all these additional people, politics began to enter the equation. And politics and friendship rarely make good bedfellows. People started questioning Jose Torres’ methods of running the site, and he became involved in some dealings that a lot of people felt were pretty shady. But you can read more about that in the next segment, as our Low-Gain interview series explores the seedy underbelly of the chipmusic scene.